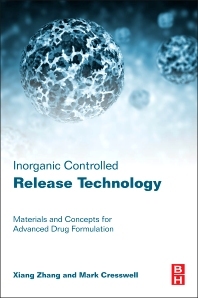 Inorganic Controlled Release Technology: Materials and Concepts for Advanced Drug Formulation provides a practical guide to the use and applications of inorganic controlled release technology (iCRT) for drug delivery and other healthcare applications, focusing on newly developed inorganic materials such as bioresorbable glasses and bioceramics. The use of these materials is introduced for a wide range of applications that cover inorganic drug delivery systems for new drug development and the reformulation of existing drugs. The book describes basic concepts, principles, and industrial practices by discussing materials chemistry, physics, nano/microstructure, formulation, materials processing, and case studies, as well as the evaluation and characterization of iCRT systems commonly investigated during industrial R&D. Pharmaceutical scientists, formulation specialists, engineers, doctors, clinicians, managers and later year undergraduates and postgraduates working in the pharmaceutical, cosmetic, veterinary and agricultural sectors. Dr Xiang Zhang, the Royal Society Industry Fellow at University of Cambridge, is a materials scientist and one of the leading biomaterials and medical devices experts in the world with 33 years combined experience, 17 years in academia and 16 years in industry. He places particular emphasis on carrying out fundamental but applied research as he believes that this in depth fundamental understanding of specific scientific issues is the key to the design and development of successful medical products for industry to benefit society. Dr Zhang undertook his PhD and postdoctoral research at Cranfield University where he studied materials physics and nano-fracture mechanics of organic and inorganic hybrid materials and developed new materials for ICI the largest chemical manufacturer in Britain at that time. He was awarded an industrial fellowship at the University of Cambridge in 1995. His industry experience was gained at Abbott in 1999, where, as Principal Scientist, his work covered almost all aspects of medical materials and devices from R&D and manufacturing. Further industrial experiences were gained with Cambridge NanoTech and Lucideon as Consultant Director and Principal Consultant respectively, working for worldwide clients to provide materials solutions for pharmaceutical companies and research institutes. Dr Mark Cresswell is a Senior Scientist at Lucideon and has been instrumental in developing Lucideon’s iCRT (inorganic Controlled Release Technologies) research programme. His research covers a wide spectrum of the chemical sciences which has enabled him to become an expert in his field. In addition to the inorganic chemistry discussed in this iCRT book, he has good experience in organic synthetic chemistry. This includes the development of new synthetic routes for solution-phase-based peptide synthesis and the use of a diastereoselective Pictet-Spengler reaction to generate optically pure tetrahydro-β-carbolines. This methodology was then applied to the asymmetric synthesis of medicinally useful indole alkaloids. Dr Cresswell was awarded an MChem in Chemistry with Medicinal Chemistry from the University of Manchester and his PhD from Keele University. At Lucideon Dr Cresswell is responsible for the development of innovative new materials for healthcare applications with a focus on the application of novel inorganic-based drug delivery systems. Particular research interests are the use of novel sol-gel processing to prepare silicate and phosphate derived porous drug delivery systems and the design of new glasses with controlled dissolution properties.